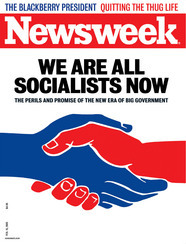 Amritas pointed me in the direction of the latest Newsweek cover. The article blames the whole thing on George Bush, and trust me, I think he deserves some blame here for his obscene spending problems. But the article was a little too triumphant about laying the blame at Bush's feet and washing Obama's hands of any culpability. Polls show that Americans don't trust government and still don't want big government. They do, however, want what government delivers, like health care and national defense and, now, protections from banking and housing failure. So our old people can die in nursing homes with no a/c while the staff is all on holiday. On the plus side, that will help with the growing medicaid bills for everyone too old to care for themselves. I'm afraid to see what they were for the up-for-election Representatives and for this current "stimulus". But in the end, I bet we're getting what we deserve. ACK. What happens when the euthanasia movement gains more traction??? And I feel the need to blog about it, but I'll just state it quickly here: "We" are NOT all social-ists. When the revolution comes it's not going to be pretty. Nor will it be televised. We are all ikwO now. Can't help but do a victory dance at the grave of capitalism. So how does it feel to be my cOmrades? Let's make revOlutiOn together! "There is no one but the One." I hope we will still recognize America by the time we get a chance to vote Obama out of office, and maybe the American public will have a serious case of "buyer's remorse" for giving control of both houses of Congress to the Dems when the 2010 mid-terms roll around. One can only hope. My fear is the damage done before then (especially with all those little things tucked away inside this "emergency" "stimulus" package that they are all in too much of a hurry to pretend to notice, or for US to get wind of it).